Jacinta is a Lecturer/Researcher and an Organisational Advisor. She is a former primary teacher. She lectures part-time in Trinity College on the M.Ed. programme; in Marino Institute of Education on the B.Sc. and B.Ed. programmes; and provides guest lectures for other colleges. She also provides professional development training and presentations for schools, colleges and various other public and private organisations. The focus of much of this work is the characteristics, skills and benefits of creating and maintaining a positive/effective work environment. Her Master’s thesis had workplace bullying in schools as its theme and she is an acknowledged expert on that subject. She conducts awareness sessions on bullying in schools and workplaces. Her focus is on prevention and minimisation of negative and inappropriate workplace behaviours and on the links between organisational culture and climate and the prevalence of those behaviours. Providing strategies for improving how we communicate/ interact with each other in every environment is the theme of much of her work. She regularly works with school principals on the impact of their behaviours, relationships and emotions on school effectiveness. 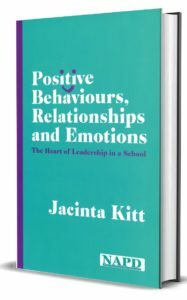 Jacinta Kitt contends in this book that managing interpersonal behaviours, relationships, and emotions is an essential element of school leadership, not an optional extra. It impacts, not merely on the atmosphere of the school, but also on the quality of teaching and learning, the well–being of staff and students.